Winston-Salem, NC – May 9, 2018 – Today the North Carolina Healthcare Association (NCHA) and the NC Department of Health and Human Services (DHHS) announced grant awards to six North Carolina hospitals and health systems as part of a pilot program to combat the opioid crisis facing our state. The awards are part of a $1.37 million grant, funded through DHHS, that will enable participating NC hospitals to embed certified peer support specialists in their emergency departments to connect patients presenting with opioid overdose to treatment, recovery, and harm reduction supports. Sites were selected based on applications and include: Carolinas Healthcare System Northeast (part of Atrium Health), Cone Health, Novant Health Presbyterian Medical Center, Southeastern Regional Medical Center, UNC Hospital, and Wake Forest Baptist Medical Center. Each participating facility will receive up to $180,000 in reimbursement for the one-year pilot. Hospitals commit to hire a minimum of two certified peer support specialists, each of whom have been in recovery for at least three years, to act as liaisons between the emergency department and the community. Wake Forest Baptist will work with NCHA to provide technical assistance and training for pilot sites. Grant recipients have been notified and will begin implementation immediately. 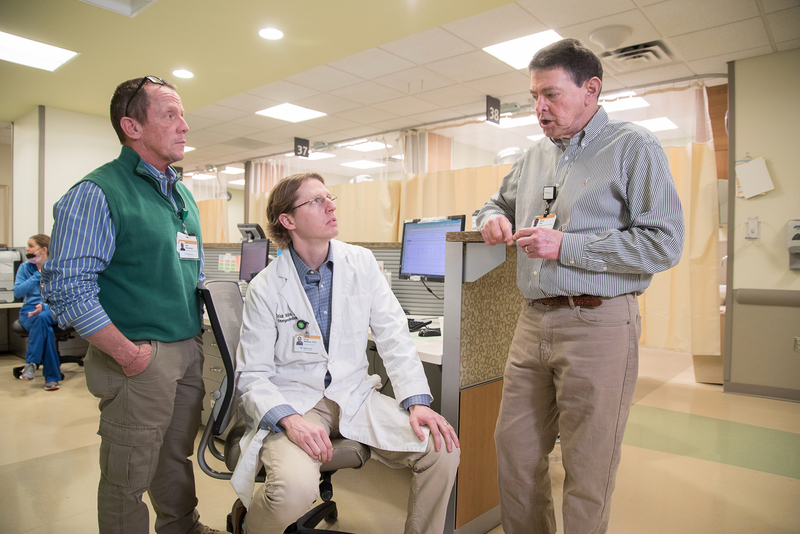 Photo: Emergency physician Dr. Christopher “Crick” Watkins confers with peer support specialists Terry Cox and Bob Richardson at Wake Forest Baptist Medical Center. Article: “Peer support specialists offer experienced-based help to patients with substance use disorders,” Wake Forest Baptist Healthwire. b-roll: Video of peer support specialists at work is available from Wake Forest Baptist Medical Center. Please contact Joe McCloskey at Wake Forest Baptist Medical Center.